Leftovers might be the bane of my existence...well, that and cats, of course. That just gave me an idea! Leftover cats! GROSS!!!! This is the time of year in which every celebrity chef is dolling out turkey tips and leftover make-overs. These recipes are not a solution to the leftover problem in America. No one really wants a turkey lasagna, turkey tacos, turkey hash or turkey chili. These chef's seem to forget that most of us baste our birds in something sweet and savory and an orange glaze does not fit into a lasagna or tacos, for that matter. My palette is not ready for that level of fusion cooking. Not a single American family needs the insanity of Guy Fieri's "Amped up, pumped up, coked out, stuffing, stuffed jalapeno poppers with a side of cranberry, chipotle dipping sauce!" I suggest a simpler/saucier method of leftover transformation. All unwanted leftovers should be turned into mulch or given to those less fortunate than ourselves. 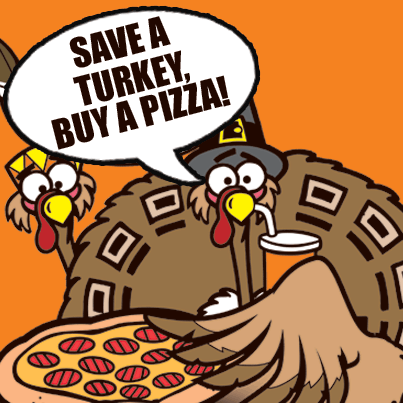 Little Ceasar's or (insert pizza restaurant chain) should offer one medium/one topping pizza to any customer who brings in, at least, one pound of their leftover Thanksgiving Day dinner. The leftovers will not be accepted if more than two days old. What would Little Ceasar's have to gain? Well, a charitable tax write-off for starters and let's keep in mind that no one buys just one medium pizza. God knows, I'm gonna get some damn cinnastix, cheesybread, hot wings or a jug of Pepsi. Carbs beget carbs beget high fructose corn syrup, so sayeth the Lord. The pseudo-Italian food impulse buys are endless. Little Ceasar's would rake in the bucks while I rake out my turkey. Rake out? Can you even do that? Who knows. Thanksgiving is great but what I am really thankful for this year is pizza.